The Cranston was created by New York bartender Rafa García Febles. Rafa is a prolific cocktail creator and writer of the DrunkLab blog. In this simple recipe, he takes rye whiskey and mixes it with raspberry syrup (or cassis). The addition of fresh basil is a revelation we haven't enjoyed since we fell in love with the Gin Basil Smash. Who knew the rye-raspberry combination would work so nicely? Muddle a sprig of fresh basil in the bottom of a mixing glass. Add the other ingredients, stir with ice, then strain over crushed ice in a julep cup. Garnish with basil. Like any Julep, this is a sipper. The emphasis is on the rye, which can bite a bit at first, but as the drink cools and dilutes, it becomes more and more refreshing. There's no missing the other flavors either. The basil pairs beautifully with raspberry adding a luxurious scent to the experience both from the garnish and through the straw. It's on the sweeter side which is typical of Juleps and Old Fashioneds. If that turns you off a bit, we don't think anyone would mind if you added a quarter ounce of lemon juice. According to Rafa's notes, you could also add a dash or two of bitters, but we decided to take our medicine straight in order to experience the full flavors of our raspberry syrup. It's a small, but potent quantity overall, so get yourself a short tumbler or a silver cup for this drink. 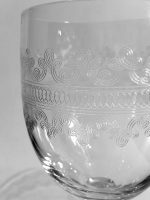 We used a wonderfully etched water glass that was just the right size and filled it with blended ice "snow" which always works nicely. After pouring the cocktail, some of the ice will collapse. 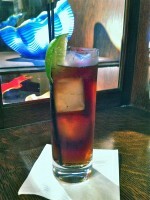 Add more crushed ice to dome up the top and poke a hole for your garnish and straws. 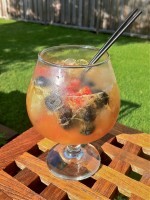 It's fun to have another cocktail for summer that uses fresh seasonal items from the market and/or the garden. Cheers!